A public vote on any Brexit deal could “solve the national crisis” in the UK, Labour’s deputy leader has said. 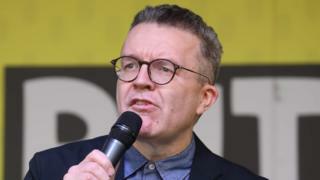 Tom Watson said he was a “reluctant convert” to a confirmatory ballot but if MPs “failed” to do their job, the public could make the final call. He suggested Labour MPs would find it “a bit difficult” to accept any outcome which excluded a referendum option. On a visit to Wales to celebrate Labour’s victory in the Newport West by-election, Mr Corbyn said the issue of another referendum was still “in the mix”, but Parliament had twice discussed and rejected the idea. Mrs May has now written to European council President Donald Tusk to ask for an extension until 30 June – but said she still hopes to leave before 23 May so the UK does not have to take part in European elections taking place that month. Labour agreed a policy at its last conference that if Parliament voted down the government’s deal or talks end in no deal, there should be a general election. But if they cannot force one – Labour’s attempt to call a no confidence vote in January failed – then the party “must support all options remaining on the table, including campaigning for a public vote”.